When the family names and places aren't yours, how can you be sure it's them? I wouldn't research my ex-in-laws at all if they weren't my sons' ancestors. But since they are, once in a while I check to see what else I can learn about them. The main problem with researching your in-laws is the lack of familiarity. When it's your family, the names and places you discover are familiar. You can remember how Grandpa always mentioned the name of his hometown. You heard your mom talk about her great uncle living in a little room in her building. But when it's not your family, you have so much less to go on. What can you do? When my 1st son was born, I filled in a family tree chart in his baby book. My ex-mother- and father-in-law gave me the names for their side of the family. The baby-book chart only goes back as far as the baby's great grandparents. But it's a good start. Here are 5 tips for building that less-familiar family tree. One document after another, you can make progress on that in-law's family tree. Try to find the latest census record you can for the family. For me, that's the 1940 census for each of my ex-husband's parents. (Let's call them ex-Mom and ex-Dad.) This is the first step to learning more about the families. These census pages tell me where ex-Mom and ex-Dad lived in 1940 and 1935. They confirm ex-Mom's siblings' names and that ex-Dad was an only child. Now I have the approximate birth years and birth places of their parents. Each tidbit of information gives clues to help find more documents. Keep building on each fact you learn. 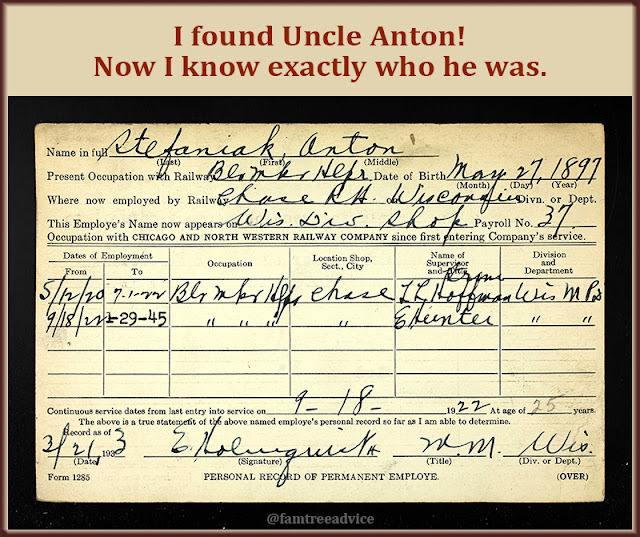 An odd little memory came in handy when I found Uncle Anton. One snippet of a memory proved to be very helpful. I remember visiting my ex-in-laws' vacation home in the 1980s. I went up to the attic to fetch something and saw an old hat. It was a black bowler hat with a sheen to it. Pinned to it was a piece of paper that said "Uncle Anton's hat". Knowing there was an Uncle Anton helped me positively identify the family in the 1900 census. Both father and son were named Anton. Another son, John, was ex-Mom's father. That meant I'd found another generation, plus siblings. And that led to many more documents. A rock-solid bit of family lore—debunked! For years we thought ex-Dad's mother's uncle was Captain Smith who went down at the helm of the Titanic. I met ex-Dad's mom. This sweet old woman was deeply ashamed that her father Walter Smith's brother was the captain. My ex-Dad even belonged to a Titanic historic association. When my son's school friends didn't believe he was related to Captain Smith, I said, "Now I know how to prove it." 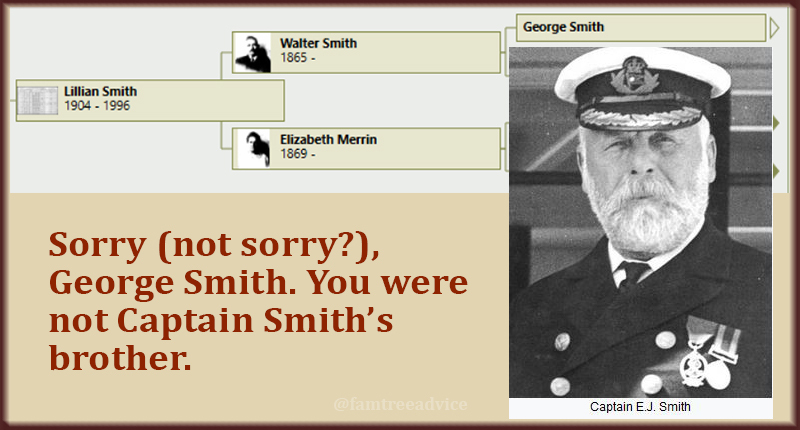 So I used my new genealogy research skills and quickly learned…wait for it…Captain Smith had no siblings! That is, he had only half-siblings whose last name was Hancock, not Smith. What went wrong there? My ex-Dad came to realize the truth, but by then, his mom had passed away. Have you heard any family stories with a single drop of historical fact you can investigate? Here's where you need to be careful. Without first-hand knowledge of the family, it will be impossible to be sure of some documents. For example, take ex-Mom's maternal grandfather Edmund. The 1910 U.S. Federal Census says he arrived in America in 1889 and was naturalized by 1910. I found an 1889 ship manifest with a man from Ireland who is the right age and has the right name. But ship manifests in 1889 don't offer much information. How can I be sure this is my guy? For now I've saved the URL of the manifest, but I haven't added it to my family tree. 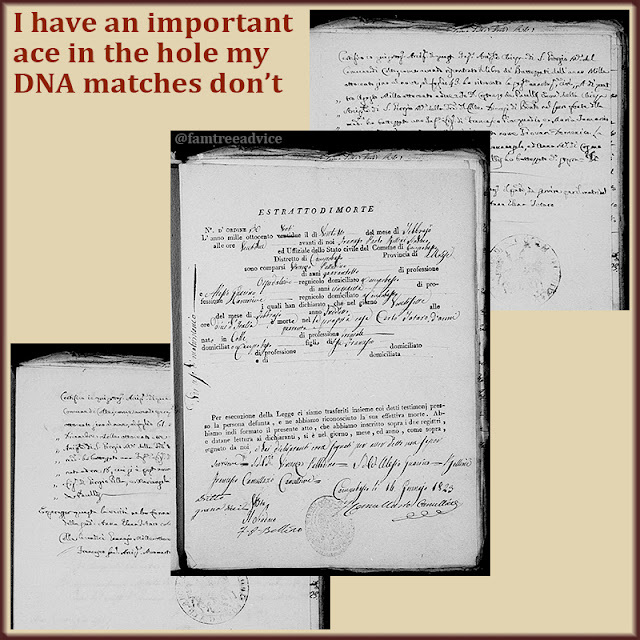 The best way to prove I'm looking at the right Edmund is to find his naturalization papers. So far, I can't find those papers. Of course you should never trust someone else's family tree if it has no sources. But you can use it for clues. I found a relative with a published family tree. This took ex-Dad's paternal line back several generations. Using this tree as a guide, I searched for documents on Ancestry.com to prove whether the tree was right or wrong. With this helpful tree, I went back as far as a set of 5th great grandparents for my sons. If you use someone else's tree for its clues, be sure to cite the tree as a source. I'm happy when I can replace that family tree citation with a more formal source (like "England, Select Births and Christenings, 1538–1975"). But until you have proof in hand, add a citation so you know where you found this detail. While you may never get as far on your in-laws side as you do on your own, you can do it justice. Use your skills to gather every piece of low-hanging fruit. And see where it leads you. Don't miss out! Please follow me on Twitter or Facebook. Thank you! How hard you work at genealogy depends on motivation, and a touch of fever. to solve a family mystery? to connect to your roots? a search for royal or famous ancestors? because everybody else is doing it? Once you catch genealogy fever, you may forget your first motivation. And if you have caught the fever, that's good. You'll be more likely to practice thorough, careful genealogy. Here's how my own interest began, and where I am now. In 2003 as I was planning my wedding, my husband-to-be was planning our honeymoon in Italy. I'd never been to Italy, and I knew so little about my family history there. It was at my wedding that I learned my great grandmother's last name was Caruso. Here's the moment my genealogy obsession began, in Grandpa's hometown. While staying in Sorrento, we took a day trip to the town where my grandfather was born: Colle Sannita. It was a life-changing experience for me. I felt as if something were calling to me. I felt I belonged there. I felt as if I could melt into the ground itself. Back home, I wanted to learn more. Where did the branches of my family tree begin hundreds of years ago? That strong emotional feeling I had in Italy made me start working on my family tree. Today, 16 years later, I've got a carefully built family tree with more than 20,000 people. 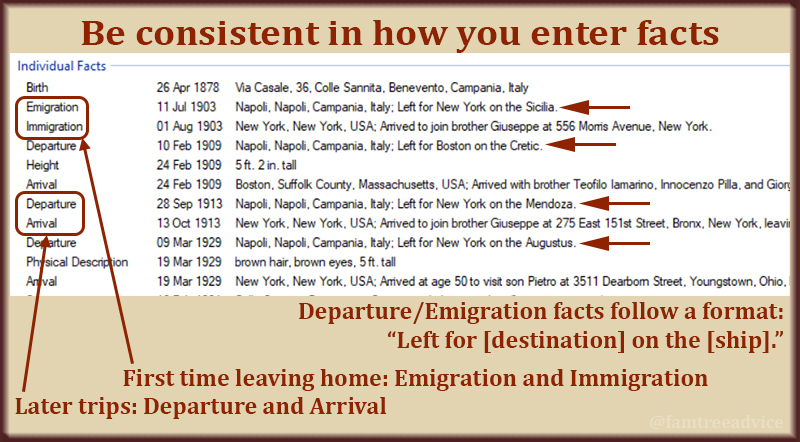 Nearly every Italian in my tree was born within a 15-mile radius. That means I can harvest thousands of relatives from the vital records of one town. And I did. I found out I'm related by blood or marriage to almost everyone in my grandfathers' hometowns. Some will say that what I'm doing is not family history. Well, my ancestors were illiterate. They survived by working their land. These vital records are all that remains. The more families I build from these 19th century documents, the more DNA matches I can connect to. I've had a lot of luck lately picking a DNA match with any size tree, and working to find our connection. As I build more families, I'm building connections to more of my DNA matches. My "overkill" approach is the reason I know the names of a good number of my 6th, 7th, and 8th great grandparents. Maybe I had to find marriage records for a bunch of siblings before I found the earlier generation. To me, it's totally worth the effort. How much will you miss if you only look at your direct ancestors? I'm no longer shocked when a 19th century Italian man remarries one month after his wife died. Seeing how common it was for a widower to marry a much younger woman and have more kids helped me. It's no longer gross that my great great grandfather's second wife was his daughter's age. turn that line green in my inventory spreadsheet. Green means it's in my family tree. As I add more documents, my family tree becomes stronger. So far, I did this for one towns' 1809 births, deaths, and marriages. The moment I finished, I moved on to 1810 births. It's crazy to think how many people and relationships I'll add to my tree by doing this. Not as obsessed as me? OK. You don't have to piece together the family of your 5th cousin 4 times removed. But I'll keep going. Because the people from these documents are more than names and dates. They're calling to me. We belong to one another. They are what makes my family tree come alive. If genealogy were a race, we'd all lose! Take the time to do it right. We all know how exciting it is. You finally found that one document you really need for your family tree! Let's say it's a census form that tells you an immigration year. You're so eager to find that ship manifest that you skip the details. You enter only part of the new information from the census form. You plan to come back and do it the right way. But what if you never do? If you don't harvest this information now, you may never do it. That census form may have a bunch of children to add to your family. Or it may have the wife's maiden name. But you might forget you have all those facts waiting for you. No matter how much that next document is calling you, it's time for some discipline. Doing things the right way, every time, will give you a better family tree. It will help you avoid making mistakes. Take the time to process each new document as you find it. If it's a census form, record the birth year, address, and occupation (if there is one) for each member of the household. Attach the image of the census to each person in your tree who's on that page. Being thorough, and following 4 basic guidelines, will give you a well-crafted family. Choose a style and stick to it. This will make your tree more professional, and make you more proud of your work. Names. Do you want to put last names in CAPITAL LETTERS? Then do it each time. I prefer to record everyone's given name. 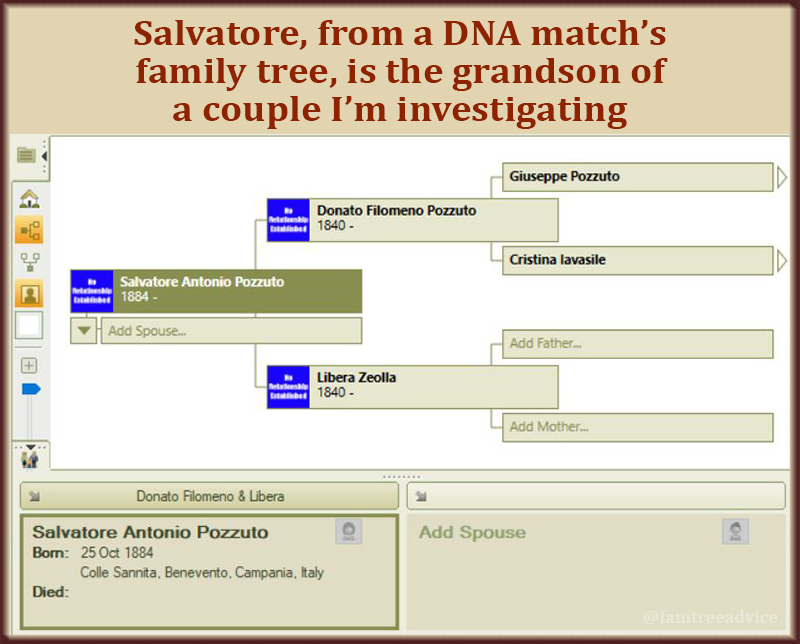 My great grandfather was known as Patsy Marino in America, he's Pasquale Iamarino in my tree. You can record the "also known as" facts separately. Dates. Countries around the world use different date formats, so try to be more universal. I find that DD Mon YYYY is clear. 29 Jul 1969. 01 Jan 1856. Choose your style and be consistent. Places. 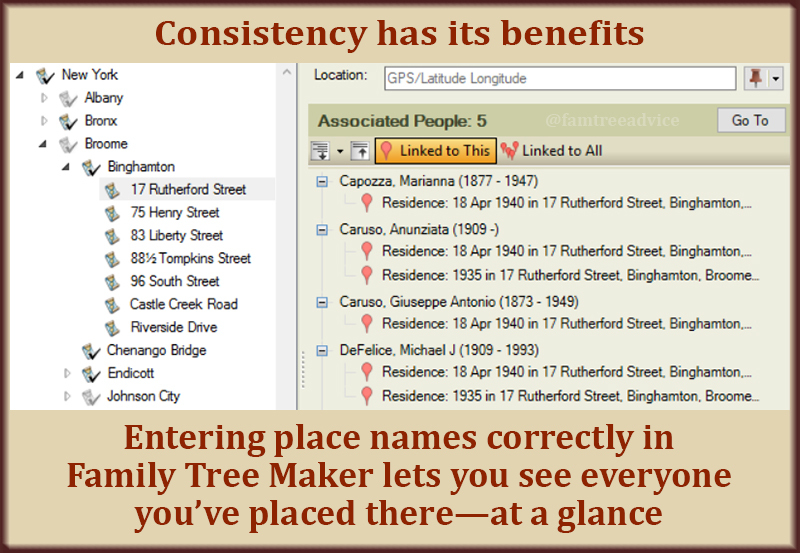 Family Tree Maker is great about suggesting proper place names as you type. If an old address doesn't exist anymore, I like to enter it how it was. Be consistent in how you enter your facts, and you'll reap the benefits. Don't skip them! When you return to work on a particular family 3 years from now, you're not going to know where you got your "facts" from. How reliable are they? Should you start from scratch? Record your sources immediately. It doesn't have to be hard. See "6 Easy Steps to Valuable Source Citations". Capture an image of every document you find for your people. Attach them to the right people in your tree. Annotate the images with information about them and where they came from. See "Add Proof and a Breadcrumb to Family Tree Documents". If you follow the pattern you create, you'll always enter information the right way. I have a new term I want to trademark. GeneaLOGICAL™. We all need to have our logical hats on when we're doing genealogy. Your software program may be able to help with that. It can alert you when you've attached a baby to a man who's been dead more than 9 months, or a girl who's under 13 years old. If you aren't using software that can alert you to problems, be on your toes. Did you attach a baby to its grandfather instead of its father? Did you attach the baby to the wrong couple with similar names? 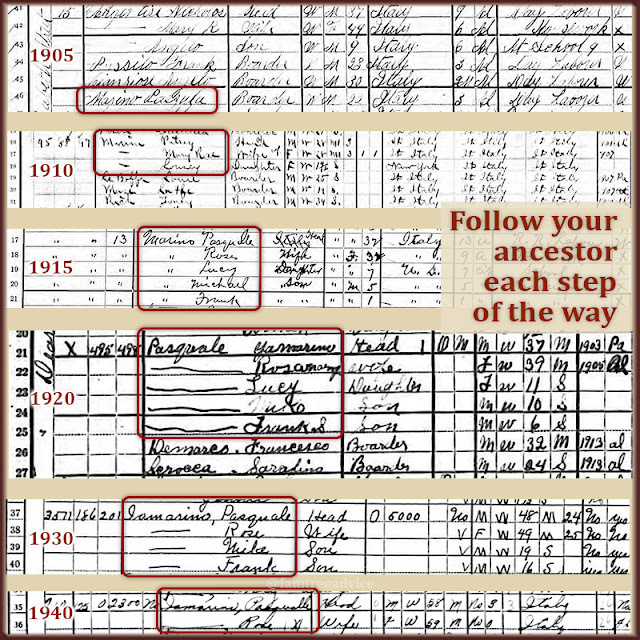 See "Organize Your Genealogy Research By Choosing Your Style". So take your time. Be complete, consistent, and logical. That next document isn't going anywhere, and you want your tree to be ready for it. The clock is ticking for me to solve a DNA match. Let's open the toolbox. I want to show them their connection. It's been about 2 years since I discovered my parents share some DNA. I want to figure out their connection while they're still able to get a laugh out of it. Every branch of my family tree came from one region in Southern Italy. Each family came from a small town of no more than 2,000 people. All their towns were pretty close to one another. Endogamy was the name of the game. That means nearly everyone in town married someone else from their little town. Or maybe the next town. Those intermarriages are the main reason this puzzle is still a puzzle. My family tree has more than 20,000 people. At least 17,000 are 17th–19th century Italian countrymen and women. I hoped to find a marriage between someone from one of my dad's hometowns and someone from one of my mom's hometowns. But there are too many people. And my parents aren't getting any younger. I needed to use some tools. My parents have both tested. I've got their results on AncestryDNA and GEDmatch. On Ancestry I can see that my parents share a few DNA matches, not counting me. Two of those matches have family trees with a couple of familiar last names. I know these names come from my paternal grandparents' hometown in Italy. They're in my tree now, but there's no known connection to my mom. 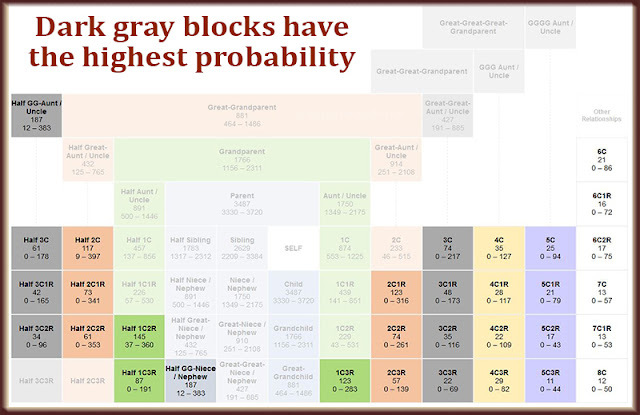 I used Dana Leeds' color-clustering method last November. I bent the rules a bit and added color blocks for the matches of my matches. 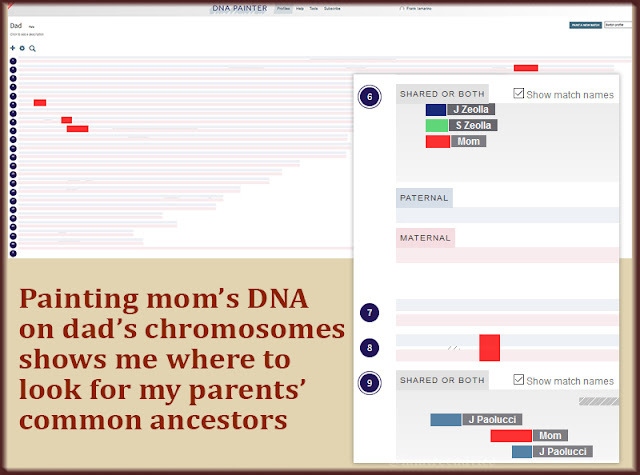 DNA Painter shows where my mom and others intersect on my dad's chromosomes. The first time I used DNA Painter, I hadn't done my homework. I painted 92% of my chromosomes, but I didn't have anything there to answer my key question. Where do my parents intersect? Then I realized I should be painting my dad's DNA, not mine. Most of the DNA matches I see are from his side of the family. So what if I paint my mom's DNA onto my dad's chromosomes and see what that looks like. Instead of painting every DNA match, I chose 3 people with the last name Zeolla. Two of them are almost a dead-on match for my mom! The 2 Zeollas and my mom share the same segment of my dad's 6th chromosome. There is one other fascinating match on my dad's 9th chromosome. There's an overlap between my mom and the brother-in-law of my dad's aunt. He's my cousins' uncle. It's too funny. DNA Painter also helps me estimate my parents' relationship. I haven't found my parents' shared ancestors yet. But I didn't have to go too far to find the intersection of the names Zeolla and Pozzuto. My 4th great grandparents on my dad's side are Nicolangelo Zeolla and Giovannangela Pozzuto. My mom is actually a pretty decent DNA match for my dad. They share 37 cM (centiMorgans) across 4 segments. AncestryDNA estimates they are 4th–6th cousins. Third cousins share 2nd great grandparents. So my dad's 2nd great grandfather, Teofilo Zeolla, may be the key. He had 2 wives. What if he had a child with his 2nd wife who somehow connects to my mom? Everything seems to point to my 3rd great grandfather, Teofilo Zeolla. After trying all these tools, I've got my big assignment. I have to find all Teofilo's children. Then I have to find out who they married and who their kids were. Please, please, please let one of the kids marry someone from one of my mom's hometowns! If you've got an important DNA puzzle to solve, use every tool you can. They can steer you in the right direction. To paraphrase "The Matrix", only try to realize the truth. There is no wall. 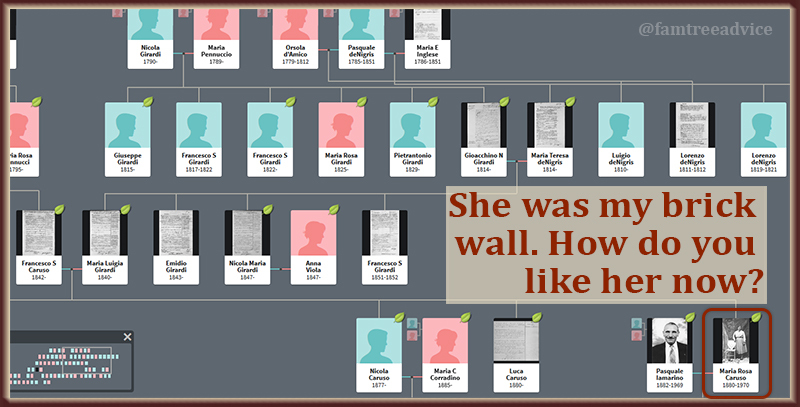 Every genealogy fan has at least one brick wall that drives them crazy. And we all want to know the secret: How do I break through my brick wall? Since everyone's brick wall is different, we've got to take a few steps before we can start to break through. The first step in breaking through a brick wall is clearly defining one specific problem. When I was starting to build my family tree, I got pretty far on my dad's side. But his mother's mother—Maria Rosa Caruso—quickly became my brick wall. I couldn't get anywhere on her line. Is that when we decide something is a brick wall? When we can't move beyond this one person? Not long ago, I couldn't even find her parents' names. Look at her branch now. You can define the problem by stating one key fact you're missing. What is it that's holding you back? 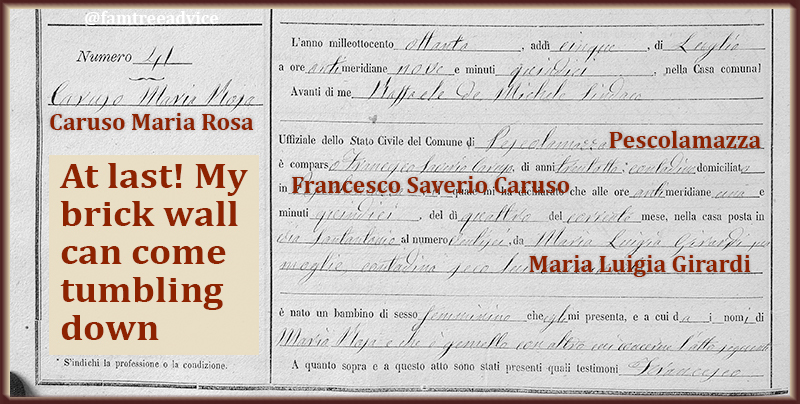 My Brick Wall Definition: I can't find Maria Rosa Caruso on a ship manifest because I don't know her hometown in Italy. My definition isn't "I can't fill out her branch of my family tree". It's smaller. It's the next step I need to take but can't. I need to find her coming to America, but I can't positively identify her without her hometown. Many years ago, a cousin-in-law found me on an Italian genealogy message board. Her husband is also the great grandchild of Maria Rosa Caruso. But he had the advantage of growing up with her and the Ohio part of my family. Now I could find her on a ship manifest. And I learned that she came to America—4 months before marrying my great grandfather—to join her brother Giuseppe. So I searched for Giuseppe, too. I began to piece together several Caruso siblings and the places where they lived. Some of the siblings' ship manifests told me their father's name. My great great grandfather was Francesco Saverio Caruso. It was Maria Rosa's brothers' documents that gave me clues to my great great grandmother's name. When I compared the 3 versions of the name—Gilardo, Girandiu, Gerard—I had a hunch her name was Girardi. That felt like a victory, but I still didn't know for sure. Then a glorious day arrived. 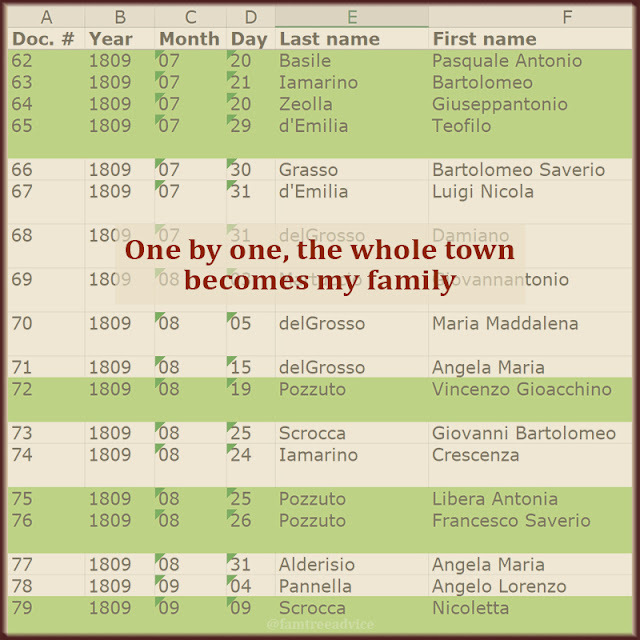 The Italian genealogy archives website (Antenati) posted the vital records from Pescolamazza. I found my great grandmother Maria Rosa's 1880 birth record, and the surprise birth record of her twin brother. This revelation came about 14 years after my search began. Her birth record confirmed, finally, my great great grandmother's name: Maria Luigia Girardi. I admit, I got lucky when those Italian vital records from the town went online. Her hometown was the one brick that brought down the wall. You can chip away at your brick wall by breaking it into smaller problems. "I can't get beyond this one relative," you say. What clues can you find about where they came from? Can you discover more about their relatives whose names you do know? Which documents might hold a clue? Immigration records, death records, wills, applications, pension forms? If you can knock out enough individual bricks, your brick wall can collapse. And what a wonderful mess that will be. I followed this basic research advice and made an absolute genealogy killing. Last week I watched YouTube videos by Crista Cowan, a chief genealogist at Ancestry.com. Crista recommends you start each genealogy research session with a question. think about what other documents might help. Yesterday I realized I was doing exactly what Crista described. I'd heard from a new DNA match whose paternal grandparents' last names were familiar to me. Her grandmother's name seemed like a misspelling of my grandmother's name, Sarracino. Here's what my thought process looked like. 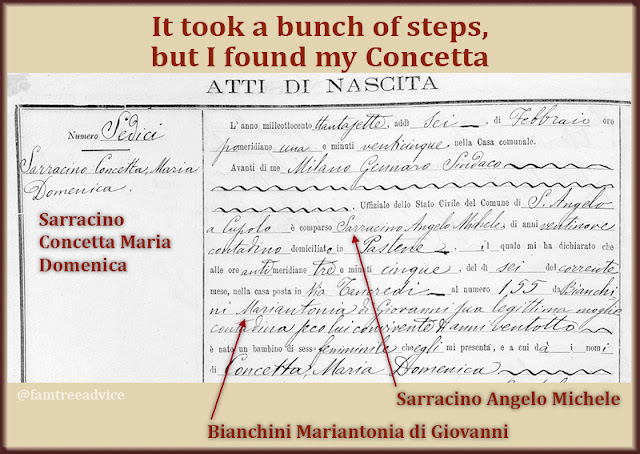 My 1st Question: Was Concetta Saraceno really Concetta Sarracino? I needed to find Concetta and her husband in the U.S. census. All I had were their names and approximate birth years. A census can tell you an immigration year. An immigration record can tell you a hometown. On the 1915 New York census, Concetta and her husband and kids live with her parents. Their names are Mike and Antonia Sarracino. Mike Sarracino was born in 1858. I needed to check other census years. I found Concetta's father's name as Angelo more than Mike. And there's always a different misspelling of Sarracino. On the 1900 census he's Angelo M Sarracino. He's married, but alone. Based on census records, I do think Concetta Saraceno is Concetta Sarracino. They even lived on the same Bronx street as my grandmother and her family. But it's only circumstantial evidence. Each document you find will hold some sort of clue. 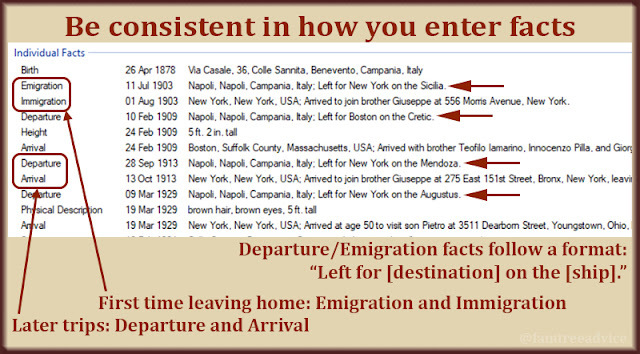 My 2nd Question: Where did Concetta and her father come from in Italy? I searched for Angelo Sarracino's immigration and naturalization papers. I found his U.S. passport application. Was he from the same little hamlet as my Sarracino ancestors? They were from Pastene ending in an E. There's a different town of Pastena ending in an A. In fact, there are a few towns named Pastena ending in an A. But none of them are in my family's Benevento province. Angelo Michele Sarracino was born on 29 Sep 1858 in Pastena, Benevento. If it didn't say "Benevento" I would think it was the wrong town. His wife is Mariantonia Bianchini. She is Antonia on the 1915 census, but that's very common. He has a daughter Concetta who was born on 5 Feb 1886 in Pastena, Benevento. He has a daughter Rosaria who was born on 22 Sep 1888 in Pastena, Benevento. With Concetta and Rosaria's birth dates, I can check my collection of Pastene vital records. Of course, they're not there. My 3rd Question: Did Angelo Michele Sarracino return to Italy to bring back his wife and daughters? 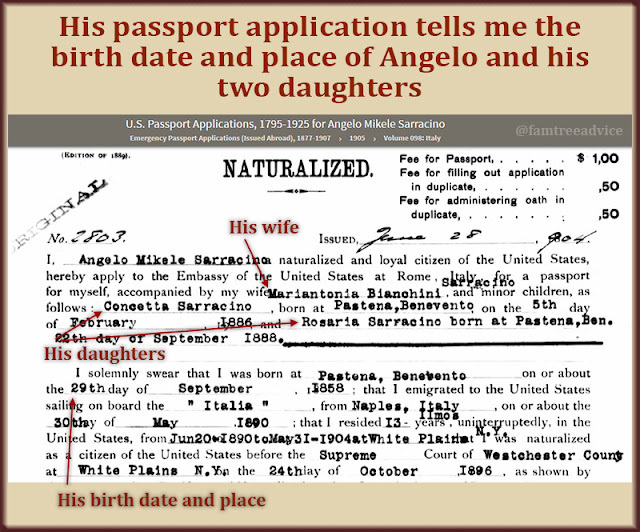 Angelo's passport application says he was in the U.S. continuously from 1890 to May 1904. He went home to Italy on 31 May 1904. Now, in June 1904, he's preparing to return to New York. I searched passengers lists for Angelo Michele Sarracino in 1904. No luck. I searched for Concetta Sarracino, his daughter. No luck. I searched for Mariantonia Bianchini, his wife. And I found the whole family. Who else is with your people when you find them? 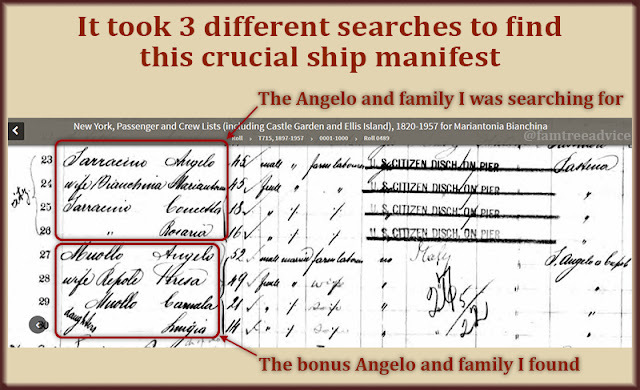 The ship manifest says Angelo was in America from 1894–1904, but his wife and children were not. Because Angelo was a U.S. citizen, the whole family gets discharged on the pier. Their hometown is still infuriatingly written as Pastena. But there's a welcome surprise on the next line. It's Angelo Muollo and his family from just outside Pastene. This is my family. My great grandfather Giovanni Sarracino's mother was a Muollo. The ship manifest doesn't list a family member in Italy. So I can't connect Angelo—and my DNA match—to other Sarracino family members. The birth records for Pastene are not available before 1861. My 4th Question: How can I connect Angelo to my family? I couldn't find Concetta and Rosaria's birth records. But then I remembered what happened with my great grandfather. He was born in Pastene in 1876. But his father didn't officially declare the birth until 1898. He had to do it so Giovanni could legally marry. Maybe Concetta and Rosaria's births were filed late, too. Maybe they were registered just in time to sail to America. I searched the town's birth records year-by-year, starting in 1904 and going backward. I found 3 other Sarracino's whose birth were reported years late. What was up with my family? Finally I found the goods. 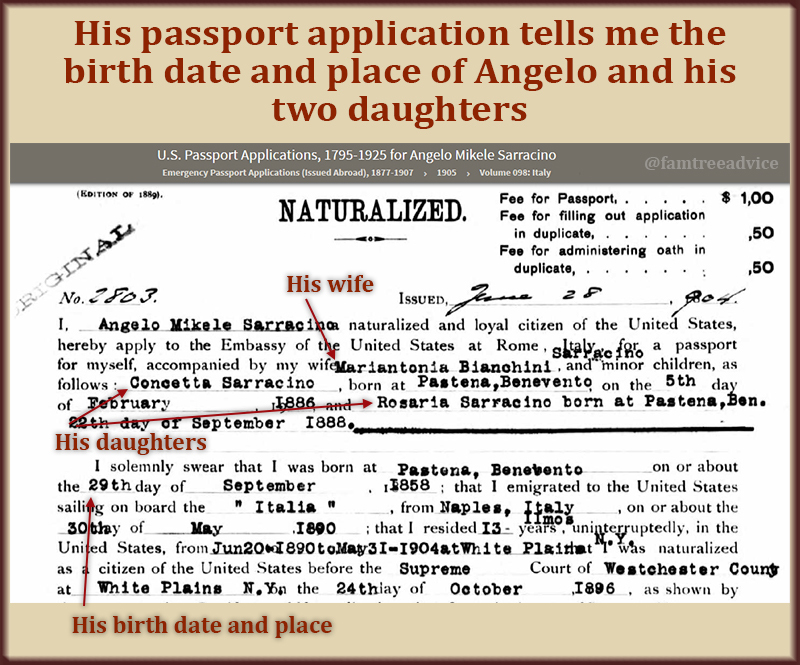 On his 1904 passport application, Angelo got his daughter Rosaria's birth date wrong. I found her exactly one year later. She was born on 22 Sep 1889, not 1888. And I learned that Angelo's father-in-law was Giovanni. Gasp! Does that mean I might find Concetta's birth record in the wrong year, too? Yes it does! Concetta Maria Domenica Sarracino was born one year later than it says on her father's passport. This is why I keep all the vital records on my computer! Now I'm sure my new DNA match is a Sarracino from Pastene like me and my mom. I still don't know who Angelo's father was, so I don't know the exact relationship. 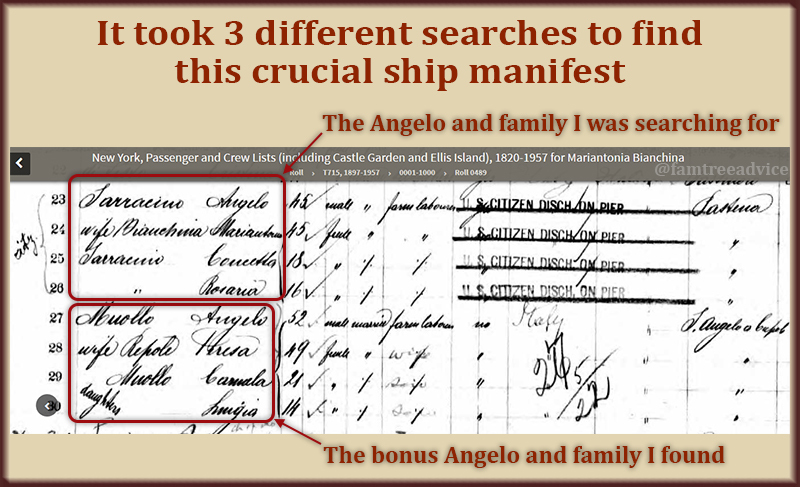 My 5th Question: How can I find the names of Angelo's parents? An Ancestry search tells me Angelo died in New York on 7 Feb 1931. His Manhattan death certificate is number 4251. But I can only see it by visiting the New York City Municipal Archives. I'm not able to do that. My last resort is to go through all the vital records I have from Pastene. I may be able to piece together Angelo and his wife's families. Only then will I know my exact relationship to my DNA match. I didn't even mention how I tracked down my match's grandfather with only his name and birth year. Census forms and ship manifests led me to a town called San Nicola Manfredi. Would you believe it's the town next door to Pastene? So, to make your genealogy research more productive, follow Crista Cowan's advice. Ask the question and figure out which records can get you the answer. Want to get your money's worth out of your DNA test? Build up your tree. When I look at my long list of DNA matches, most of them fall into the 4th-6th cousin level and further. You connect to your 4th cousins through your 3rd great grandparents. If you haven't identified your 3rd great grandparents yet, that should be your goal. But that's only the beginning. You need to find the names of all their children. Then find as many of the kids' marriages and children as possible. That's where you'll find your match to your DNA cousins. And then, hopefully, you'll learn a lot more about those branches. Ancestry DNA identifies most of my DNA matches as Mother's Side or Father's Side. And then there are my glorious three labeled Both Sides. My "Both Sides" matches are my best bet for figuring out the answer to a big question: How are my parents related? Their DNA connection is at about the 4th-to-6th cousin level. One of these uber-DNA matches has no tree. So I'm working on the other two. Here's how. One of my matches has a tree with 220 people. She and I don't have any last names in common. But I looked for her Italian names, hoping to find a familiar one. And I did. The tree contains a father and son with the last name Zerrillo. I recognize that name. And my match knows the father was born in Colle Sannita, Italy. That's my paternal grandfather's hometown. My other match has a tree with more than 1,300 people. We share one last name: Pozzuto. Pozzuto is a Colle Sannita name, too. There must be thousands of Colle Sannita descendants all around the world. I haven't linked them to my family yet, but give me time. My Zerrillo match knew the birth date of the father, Dan Zerrillo. Always keep an open mind and use your genealogy knowledge. An Italian in 1896? I knew "Dan" wasn't his name. I was betting on Donato. So I went to the collection of Italian vital records I keep on my computer. I opened up the 1896 birth records and went to the index. And there he was. Donato Zerrillo. Then I began to climb. Donato's 1896 birth record lists his parents as Francesco, born about 1855, and Libera Piacquadio. Piacquadio is one of my family names. I found Libera's 1855 birth record. Now I had her parents: Francesco, son of Giovanni, born about 1830, and Maddalena Zeolla, born about 1832. (Another family name.) I found Francesco's birth record in 1829. Now I had his parents: Giovanni Piacquadio, born about 1803, and Annaelena Totaro, born about 1804. At this point, I'd gone back far enough to be able to search for this couple's marriage record. Not every year's marriage records are available. Their son was born in 1829 when they were still pretty young. 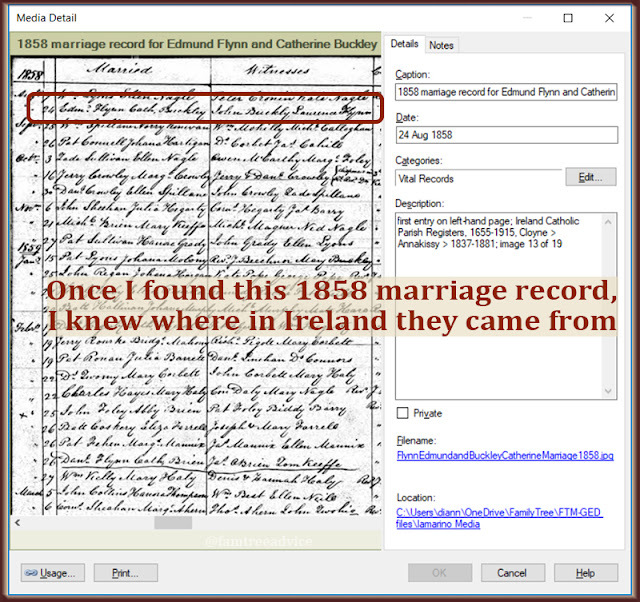 I started in 1828 and searched year after year of marriage records until I found them. Giovanna and Annaelena married in 1823. Now I have their parents: Francesco Piacquadio and Maria Iamarino (hey, that's my name! ), and Carlo Totaro and Donata Nigro. But Italian marriage records don't stop there. The groom's father, Francesco, was dead. So I have his death record with his parents' names. And the bride's father, Carlo, was dead. So I have his parents, too! In almost no time, I turned one name in my match's tree into 16 names. And I have more leads to follow. My personal research library gives me an edge my DNA matches don't have. So far, though, I haven't connected any of these people to my family tree. But I will. For my Pozzuto match, I took one person from her tree and found his birth record. Two generations later, they tied into a family that's in my tree, but not connected to me yet. You see, I know the name Pozzuto will connect me to many of my DNA matches. So I've been piecing together Pozzuto families from the town's vital records. They usually don't answer, right? But if you write to say, "I just added 20,000 people to your family tree," they might write back! And if you have done some successful work on their branch, you should definitely let them know. But remember. Some DNA testers are only in it for the pie. Use this checklist of 7 tasks to scrub your family tree clean. I want to help you make your family tree better and more professional. That's why I've been writing these genealogy articles twice a week for more than two years. Today we'll look at 7 types of family tree clean-up tasks. Together they can improve your tree in so many ways. Does every name in your family tree meet your standards? Maiden names. It's a genealogy best-practice to record women using their maiden name. Let them have their own identity. Unknown names. When you haven't discovered someone's first or last name, consider recording it as _____. This makes it clear you haven't yet filled in that blank. Credit for this goes to Ancestry.com expert Crista Cowan. I used to use the word "Unknown", but someone misunderstood that. They thought I meant no one ever knew this name. As if the person was living under an assumed identity. Names only. Some people will record a person's name as Grandma Johnson, or Jane Dad's great aunt. If you put notes on people's names, you're not helping relatives and DNA matches to find you. More than one name. I insist on recording everyone's birth name. I'll add other names (nicknames, Anglicized names, and legal name changes) as a second name fact. For more on this topic see This Genealogy Policy Takes the Guesswork Out of Names. Make sure the place names in your tree follow a consistent style. Family Tree Maker organizes your place names when they're written the right way. It's easy to click a country, then a state or province, then a town, and find a place. And with a click you'll see every name associated with a place. For more on this topic see 3 Housekeeping Tasks for a Professional-Quality Family Tree and 4 Types of Family Tree Errors Only You Can Find. Once I saw how nicely Family Tree Maker organizes place names, I cleaned them all up. Remember when you first got started in genealogy? I know I was downloading census sheets and ship manifests as fast as I could find them. Write a caption. Start with a year to force media items to display in date order. Make it clear what each document is. Add the date. Documents will almost always have an exact date on them. Add this to the date field. Choose a category. Family Tree Maker lets me pick a category from their list, or add custom categories. Now I can sort my thousands of media files by type. Describe everything about the document image. I add enough information to allow myself or anyone else to find the original image again. That includes line numbers on the page, a description of the document collection, and a URL. Add a note. There is a notes tab for each media item in Family Tree Maker. You can type any information in there. Maybe you need to record who you wrote to to get this image. 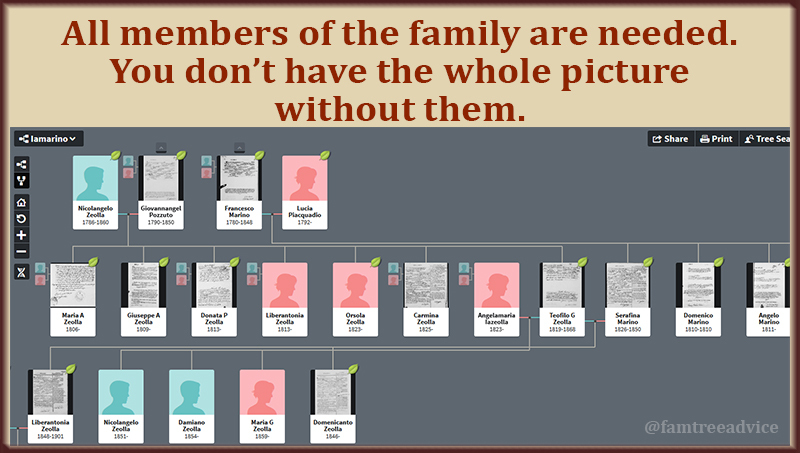 For more on this topic see Add Proof and a Breadcrumb to Family Tree Documents, and How to Increase the Value of Your Family Tree Images. I like to keep my sources simple. But I've been adding more and more detail to them. I use a simple title, like "1900 U.S. Federal Census". 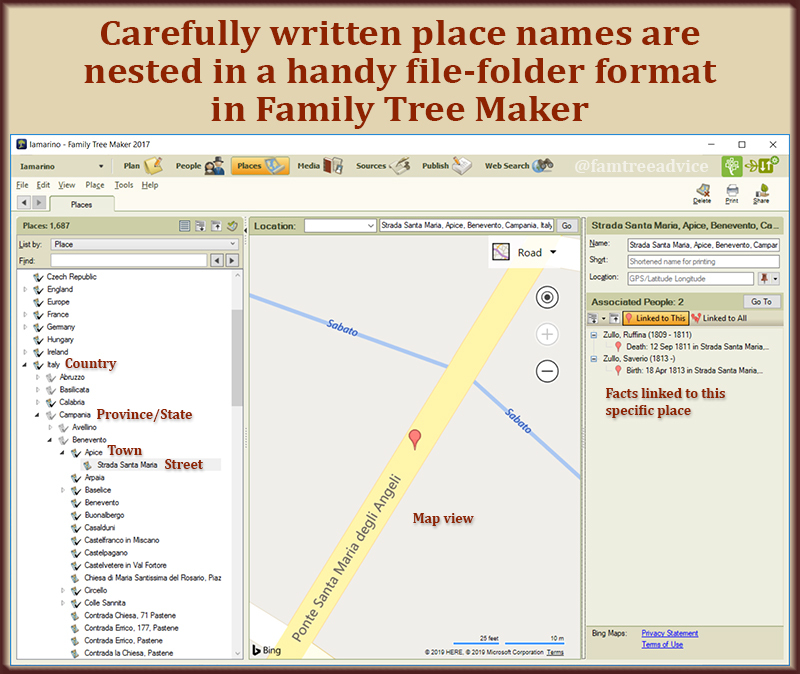 A short title doesn't clutter up the person view in Family Tree Maker. 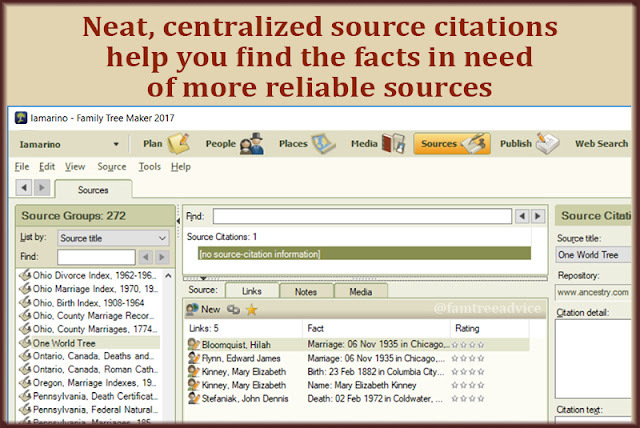 Having a neat, tight list of sources makes them easy to maintain and make better. I like that I can click any source in my tree and see every person and fact that's associated with it. I have a goal to get rid of secondary sources—like other people's trees. I need to replace them with primary sources. My source list makes it easy to find the facts I need to work on. For more on this topic see 6 Easy Steps to Valuable Source Citations. People seem to worry a lot about their document filing systems. Don't overthink it. Keep it simple and logical. Remember that you may pass your work on to a loved one some day. birth, marriage, and death certificates, etc. Because I follow a pattern, it's easy to see what a document is. 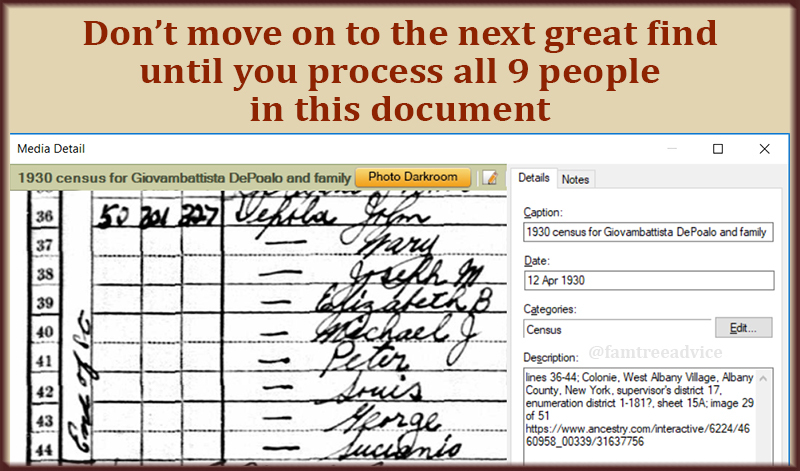 For more on this topic see 3 Rules for Naming Digital Genealogy Documents. How fatal of a heart attack would you have if all your genealogy research disappeared? Spread things out, but keep them at hand. Use your computer drive, external drives and cloud storage. Make a backup plan for your genealogy files and stick to it. Remember that two backups are better than one. Many of my files synchronize to my cloud storage the moment they change. For everything else, I make a backup every Sunday morning. Without fail. For more on this topic see 4 Ways to Protect Your Genealogy Research from Disaster. what you'd like to do when you have the chance. For more on this topic see Start Your Rainy-Day Genealogy List. That was a lot. And it's a lot of work. But chip away at these ideas and your family tree will grow stronger from your effort. Make these tasks into a to-do list and tackle it one bite at a time. It's worth it. It's the same way you get to Carnegie Hall. Practice, practice, practice. Guess what happened after I spent hours and hours reading vital records from the 1800s. I became something of an expert on the subject. A foreign language, squiggly handwriting, and countless abbreviations don't slow me down a bit. I'm used to it. And that made me practically a pro. Sue me. It was the '80s. Do you fall into one of these 3 camps? You climb one branch of your tree, adding people and facts from whichever document you just found. You don't move on until you've searched for every document for a particular family. You enjoy going off on tangents and plan to return later for the documents. All those methods are fun. 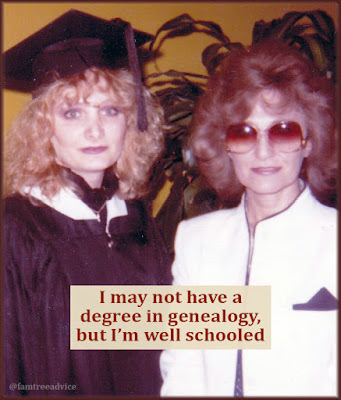 But you can become an expert on any one type of genealogy document if you make this one change. or some other type of document. Commit a good chunk of time to searching for only this type of document. I'm in the midst of searching for every census sheet I don't yet have. You'll need some way of seeing who in your family tree is missing their census sheet and for which year. I've got my Document Tracker and its "Need to find" column. I can go down the alphabetical list of names and search for every missing census. I'm up to last names beginning with L, and I'd like to knock off another letter or two this weekend. You may not have a separate tracking sheet. But maybe your document image filing system can help you figure out what you have and what you're missing. The free program Family Tree Analyzer can help you keep tabs on your census sheet finds. If all else fails, start with your parents and fan out. Go generation by generation, looking for missing censuses. Which search tricks are giving you a lot of success? Searching for a group of first names but no last name? Using Stephen Morse's tools to find the right set of census pages and going through them one at a time? Narrowing your search to a county rather than a town? As you try out different ways of searching, they'll become second nature. You'll waste less time. What facts are you seeing on the documents that you've overlooked before? The native language on the 1920 census? The place of residence in 1935 on the 1940 census? Here's a cheat sheet to show you what new questions the government asked in each U.S. Federal census. What conclusions can you draw by comparing documents? Can you tell that a certain relative died between the date of this census and the date of that census? Did the family move right before one of the children was born? Was one of the censuses wrong about the year of immigration or naturalization? Which one? 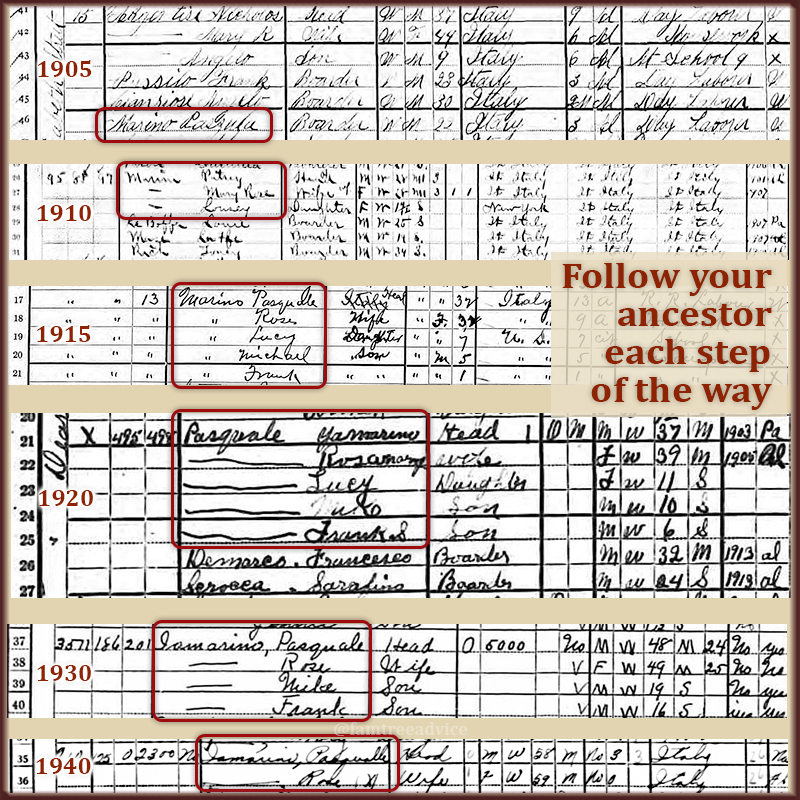 Follow your ancestors through each census to track family changes. After you spend enough time with one type of document, you will be an expert on that type of document. Where do you want to start? The moment you begin downloading those new files, take a moment to add valuable facts to the image file. In whatever way makes you comfortable, keep track of what you've found and what you need.